In his magisterial bestseller FDR, Jean Edward Smith gave us a fresh, modern look at one of the most indelible figures in American history. Now this peerless biographer returns with a new life of Dwight D. Eisenhower that is as full, rich, and revealing as anything ever written about America’s thirty-fourth president. As America searches for new heroes to lead it out of its present-day predicaments, Jean Edward Smith’s achievement lies in reintroducing us to a hero from the past whose virtues have become clouded in the mists of history. Here is Eisenhower the young dreamer, charting a course from Abilene, Kansas, to West Point, to Paris under Pershing, and beyond. Drawing on a wealth of untapped primary sources, Smith provides new insight into Ike’s maddening apprenticeship under Douglas MacArthur in Washington and the Philippines. Then the whole panorama of World War II unfolds, with Eisenhower’s superlative generalship forging the Allied path to victory through multiple reversals of fortune in North Africa and Italy, culminating in the triumphant invasion of Normandy. Smith also gives us an intriguing examination of Ike’s finances, details his wartime affair with Kay Summersby, and reveals the inside story of the 1952 Republican convention that catapulted him to the White House.Smith’s chronicle of Eisenhower’s presidential years is as compelling as it is comprehensive. 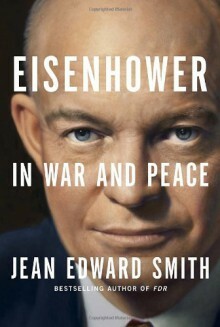 Derided by his detractors as a somnambulant caretaker, Eisenhower emerges in Smith’s perceptive retelling as both a canny politician and a skillful, decisive leader. Smith convincingly portrays an Eisenhower who engineered an end to America’s three-year no-win war in Korea, resisted calls for preventative wars against the Soviet Union and China, and boldly deployed the Seventh Fleet to protect Formosa from invasion. This Eisenhower, Smith shows us, stared down Khrushchev over Berlin and forced the withdrawal of British, French, and Israeli forces from the Suez Canal. He managed not only to keep the peace—after Ike made peace in Korea, not one American soldier was killed in action during his tenure—but also to enhance America’s prestige in the Middle East and throughout the world.Domestically, Eisenhower reduced defense spending, balanced the budget, constructed the interstate highway system, and provided social security coverage for millions who were self-employed. Ike believed that traditional American values encompassed change and progress.Unmatched in insight, Eisenhower in War and Peace at last gives us an Eisenhower for our time—and for the ages.